One of the beneifts of social media that I appreciate is the ease with which I can keep in touch with news and stories from France. I have a particular interest in Le Berry in the Région Centre and so will often browse to the local edition of newspapers. Recently a story caught my attention in Le Berry Republicain. A statue had been found in a clearing in an estate in the Sologne. 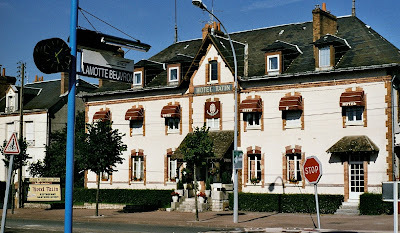 It used to belong to a factory in Vierzon but had been moved when new owners took over in the 1960s. The statue was referred to as La Française and it made me think of my favourite French symbol - Marianne. Although the French flag is the only official symbol for France, Marianne embodies the values of the nation. 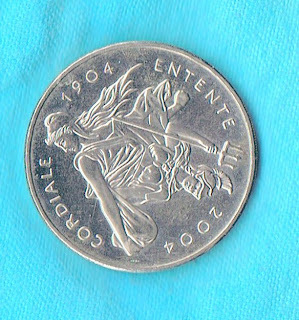 She has two sides to her character - the angry warrior on the Arc de Triomphe or the sower, scattering potential, as depicted on French coinage and stamps. The newspaper article refers to the Roman goddess, Cérès - symbol of motherhood and agricultural abundance, and the link with Marianne as sower is obvious. In Britain, Brittania has also come to symbolise the country although I have not seen her portrayed in the duality of the warrior-sower. In 2004, the Royal Mint struck a £5 coin - a crown - to mark the centenary of the Entente Cordiale between Britain and France. I have one of the coins and much admire the artistic device of bringing together Marianne and Brittania. Marianne wears her bonnet phrygien, itself a symbol of freedom from slavery - Liberty. She carries her sower's pouch ready to scatter a fistful of seeds. For her part, Brittania strikes the warrior pose. Although the two are linked, there is a clear separation between them - Liberty. Together in the round, neither takes prominence - Equality. A feminine circle, a sisterhood - Sorority. News programmes these days seem to be full of claim and counter-claim about the budget deficit and the effect of cuts in public spending. Old certainties such as buying property seem no longer to apply as house prices fall, leaving some in the position of negative equity. Canny investors suggest putting money into art purchases and others into buying and cellaring fine wine. Back in 2000, I invested in some wine. It was more of an emotional decision than a financial one because I only bought one bottle. Not any old bottle mind you! 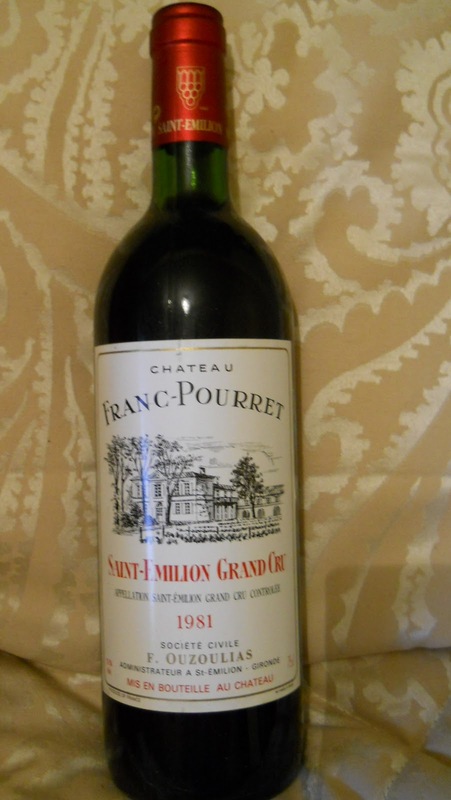 It was a Saint-Emilion Grand Cru from the Château Franc-Pourret, belonging to the Ouzoulias family. Its vintage is 1981. Now 1981 is special because it was the year in which we got married. The wine was already 19 years old when we visited the lovely medieval town of Saint-Emilion. We had family lunch in the square and still had some hours to spend before continuing our homeward journey. I had visited the town before in the 1970s, when access to the monolithic church was much freer than now. I distinctly recall remaining inside at the end of a short tour and feeling very much at ease in the place. There was no visit to the church on this occasion but we did pay our respects to one of the many shops selling high-end wine from the appellation. The merchant, intent on selling the bottle, assured us that it was excellent value and would continue improving with age. He even offered to buy it back at some future date provided that we had kept it properly. I wonder how he would know. Well, we bought it. I said it was an emotional investment and we felt confident that we could keep it until 2006 when it and our marriage would be twenty-five years old. It would, we thought, provide an appropriate focal point for an anniversary dinner. We didn't drink it and it is still there lying on its soft carton inlay in its stout wooden box. Somehow, it has managed to survive those stressful evenings when there was nothing else to pour into a relaxing glass. Apparently it is still going strong. I looked it up on the internet and it scores16 out of 20. I don't know its current value as I would have to write to the château for a price but I figure I made a good investment. Here's the funny thing, I have never tasted the wine! But by not opening it, I risk denying it its potential. It was made for drinking so we will just have to fix another date and keep to it next time. I have uncorked a plan! Surfing for details of the wine has revealed an interesting association. Catherine Ouzoulias provides luxury accommodation at the Château-Franc Pourret and offers tastings. It looks a very grand and elegant place and from the 5-star reviews she gets, sounds like a great place to stay. I wonder would she mind us bringing the wine back to its birthplace and letting us drink it there! We might just need a second bottle. We arrived to the sound of jazz music rising from the basement entrance and were warmly welcomed into the restaurant, under the canopy of a huge French flag suspended from the ceiling. We were escorted to our table and were soon enjoying a welcome glass of fizz having been invited to choose our meals from the extensive à la carte menu. We ordered and, fizz in hand, sat back to enjoy the atmosphere. Diners were in party mood and the place had filled up well. There was plenty of lively conversation, punctuated by the voices of a group of French people on a short visit to Belfast. It wasn’t long before our starters of quail salad, with provençal olives and quail egg; and foie gras arrived. Senses heightened with the aromas, tastes and sounds, Belfast soon melted into France. We continued with our main courses of seatrout and scallops; and monkfish with sweetbreads. Frites were pretty much de rigueur as was a bottle of Ropiteau L’Emage Merlot from the Pays d’Oc. By this time, the restaurant was buzzing. A distinguished monsieur from the next table joined the jazz band to give a warmly received rendition of La Vie en Rose. It went down a treat. Desserts arrived. These were a cheeseboard and some wonderful pruneaux à l’Armagnac. We ate these according to the French custom by sharing the cheeseboard to finish the wine and then moving on to the pruneaux. And then there were two firsts. The bar manager sent across a couple of glasses of Pousse Rapière, frappé style. Although the drink, from Gascgogne and based on Armagnac is usually served as an apéritif cocktail, it worked perfectly at this stage of our meal. We decided to go for its fuller-bodied parent and two ballons of Armagnac duly arrived. We had now fully engaged with the French people at the next table. From somewhere a laptop with speakers attached appeared. It turned out to contain a playlist of backing tracks and le monsieur was back on his feet entertaining us with more Piaf and a rendition of Trenet’s La Mer. Then came the second first. He serenaded ma femme with a song that I had not heard before. Later he explained that it was Souvenez-vous by Pierre Bachelet. A sad song of a war-torn France and quite lovely. You can link to it here. Time had moved on and we noticed staff taking down the canopy and carefully folding the flag. It was a gentle signal that it was time to go. And we did, taking with us some happy memories of a lovely Bastille evening in Belfast, France. Labels: Bastille, Belfast, Pousse-Rapiere; Bachelet; Souvenez vous. French voices are increasingly common around Belfast as we make progress towards becoming a more metropolitan place to live and work. Although the city is quite compact and well signposted you occasionally see people consulting their maps, wondering where they should go next. It’s a particular pleasure to hear visitors speaking French and so when I overheard a group discussing which direction they should take to get to our “big fish” I decided to introduce myself. To their obvious delight, I got them going in the right direction and walked part of the way with them, speaking French. That makes my day. I get to use the language and it is an opportunity to sustain the reputation for being friendly and welcoming. The truth is that I don’t get to France as often as I would like these days and look for ways to keep the connection strong. This francofiled blog is part of that process and so too is surfing social media to keep up to date through Facebook, Twitter and the web. If you, like me, are interested in sharing useful information with our French friends then there are some places on the web to turn to for that kind of information. Here are some that may be useful in and around Belfast. Staying on the tourist theme, you could check out the Tourist Board’s Discover Northern Ireland pdf guide which is available here for download in French. I like the guide because, while being already very familiar with the places it mentions, it contains plenty of key vocabulary to add to the “use it or lose it” language bank. Another thing that strikes me about life in Belfast is the growing number of French people who are now living, studying and working here. Several of them connect on the FrenchCo, web forum. FrenchCo organises regular meetings for its members so it is worth a few moments to check for information here. Film making is an important art form in France, so it is great to see the Queens Film Theatre (QFT) continuing its long and proud tradition of bringing the very best of French cinema to audiences here. Be sure then to look up screenings of the current programme to see what is on offer. And of course, there is our own dedicated band of Francophiles and Francophones who rendezvous each month as the Cercle Français de Belfast. The Alliance Française London supports the network of French Circles including the CFB and publishes details on its website. You might like to circle some Belfast events on the current programme. There are of course many other ways and places to keep up to date with France and French. Please add your ideas and suggestions in the comment section where I will look forward to reading them. Meantime, I had better sign out. Someone’s looking for a “poisson”. Kensington Palace Gardens, backing on to the grounds of the Palace itself, is an impressive avenue of varied architecture, the London homes of many of the world’s ambassadors. I had come, on Monday 29 March 2010, with my family and some friends to the French Ambassador’s Residence for a ceremony in which, along with a dozen others, I was to be decorated as a Chevalier in the Ordre des Palmes Académiques for services rendered to French culture. We were made to feel very much at home, although I was a bit anxious as I knew that I had to make a short speech to the gathering later on.The welcome glass of a crisp white wine helped to steady the nerves and I was able to relax into the occasion. The Residence is a beautiful, elegant home embellished with marble busts and tapestry. The salon being used for the ceremony was infused with a soft purple light accentuating the colour of the palme’s ribbon. The Ambassador, a charming man, immaculately dressed, introduced himself and welcomed us to his home. The moment had arrived. A gendarme picked up a cushion on which the palmes were resting and took up a stage right position. The recipients were also invited to take their place on the left and the ceremony began. The ambassador spoke first in English, explaining the history of the palmes. Then, he called forward each person in turn to be decorated. Speaking in French this time he addressed the recipient directly summarising the contribution the person had made. Then picking up a palme from the cushion he presented it in the name of the French Minister of Education, pinned it on and following the formal embrace invited each to speak. I spoke of the honour France had bestowed on me and through me on my family, colleagues, teachers and students who share a love of all things French. The Champagne was opened and as canapés were served, the buzz of conversation increased.The Ambassador joined each group in turn and happily posed for pictures. We talked about him coming to Belfast... and then gradually and gently it was over. It is an evening that I will always remember and an honour that I will always cherish. I see it not as a culmination of my work but as an invitation to do even more. It is a pleasure to accept. I find it hard to part with books and have several old texts from my school days. One such is a book of French Translation Passages. It dates from the late 1960s and when I found it again recently I flicked through to an extract that has come to mind several times over the years since. I have the book beside me now, open at Passage #42, relating to the writer, Anatole France. The extract appeals to me. 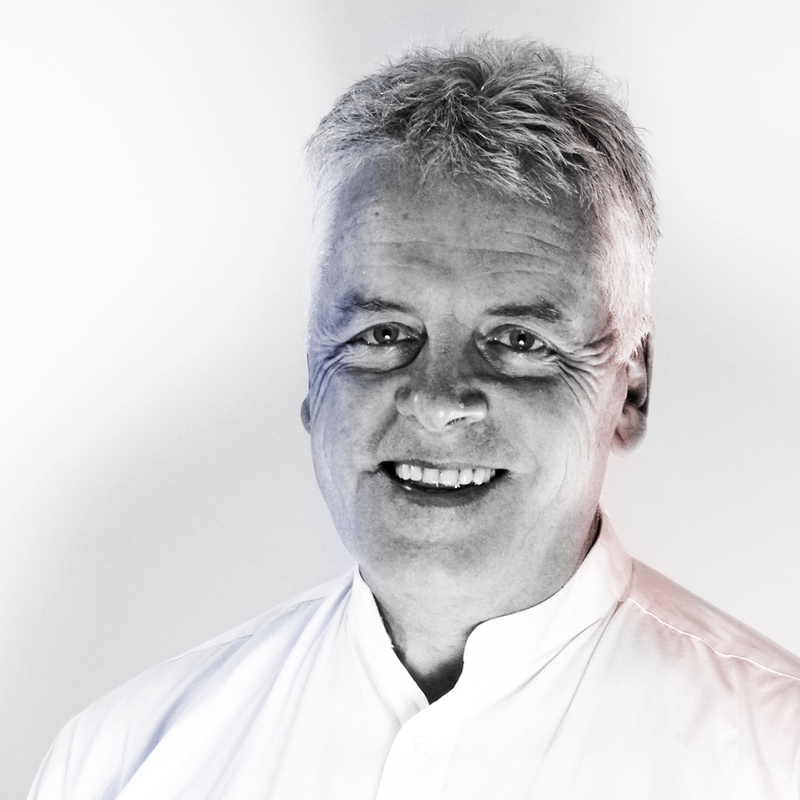 In summary it refers to a charming, greying man, nearly 70 but with a young disposition. Someone whose age suited him and who in the salon preferred to give way rather than argue. Described as a seductive speaker, drawing on literary references, he disliked stubborn, argumentative people, saying about them : - They think it is important to be right! That sounds to me now like good role model behaviour. I wonder if I also thought that as the 17-year old translating the piece for the first time. 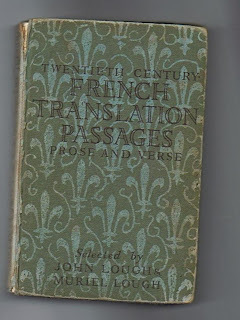 As I engaged in the lengthy, technical process of translation back then I wonder if those descriptions of Anatole France slipped under the radar to find a home in my unconscious mind where they continue to play their part in formulating my present day values and beliefs. A one time learning that has lasted for life. The material for translation was selected from Rosny, JH. (1927) Mémoires de la Vie Littéraire, Crès, Paris. It has a new lease of life with an electronic makeover. My search engine has just turned it up as an e-book and I had no difficulty locating the extract on Anatole France! The translation book, on the other hand, is showing signs of age now.